Diet always plays an important role in the success of hair transplant procedure. Believe it or not. 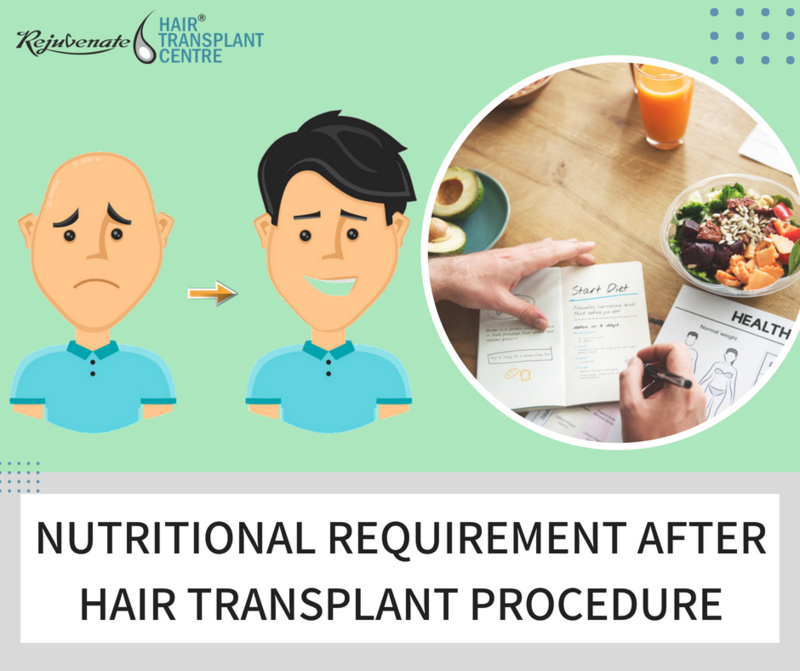 The perfect nutritional requirement after hair transplant procedure is a need for the body to recover from it. Today many doctors advise every patient to follow a healthy and balanced diet structure to get result soon. Adopting a healthy diet will provide enough micronutrient in hair follicles. A well balanced dietary intake carry out some biochemicals which support the cells in hair follicles which have a potential to promote new hair. An extreme diet that lack in essential nutrients doesn’t support transplanted hair follicles. For this reason, doctors prescribed to take food supplements over some period of months to support the new follicles. Some research also shows that a balanced diet with important nutrition can prevent “surgical shock” as it mostly happens after hair transplant surgery. If you are confused about the diet plan after hair transplantation we recommend you to focus on those diets what “you need to eat” not on “food you need to avoid”. Proteins – A protein is the main source of the building blocks of the body’s tissues and the hair itself is built from a protein called keratin. When any patient starts taking protein diet then it promotes fast healing and contributes fast growth of hair after hair transplantation. So choosing a high-quality proteins diet like fish, beans, pulses, poultry, tofu, walnuts and white eggs fulfil the source of proteins diet. Iron – Spinach, beans, oil-seeds are the great source of Iron. As Iron is one of the most important sources for the health of hair. Many green leafy is also the rich source of Iron. As it required to produce protein. Usually, Iron is known to boost hair texture, increase the flow of oxygen to the roots and scalp of hair to provide great results. People without adequate iron in their diet will face hair loss. After hair transplant doctor provide Iron supplements because it there is low iron diet consumption then the supplement will provide good nutrition level of Iron. Additionally, It also enhances the body immunity which is really necessary for the healing phase after the hair transplant done. Zinc – Many studies found that zinc is one of those nutrients which help to maintain a healthy hair. As zinc is required in building healthy cells, balancing the hormones and help in absorption of essential nutrients. It is believed to play a crucial role in DNA and RNA production and also help in a division of hair follicle cells which lead to healthy hair growth. When any person didn’t get sufficient nutrients then, in turn, causes hair shedding and hair loss. Some foods that are rich in zinc include oysters, nuts, eggs, seafood, cheese and whole grains. Vitamin D – Hair follicles are highly sensitive to hormones and several studies support that vitamin D is a great nutrient for activating hair cells growth. Nowadays our new generation is facing low levels of vitamin D which are really linked to alopecia. So, after hair transplantation, every patient must increase the intake of foods which are related to vitamin D.Some high dietary sources are salmon, mushrooms, cod liver oil, fortified orange juice and fish. In addition, direct sun exposure is also one of the tricky ways to absorb vitamin D. As you can go outside for a walk in the morning for around 15 to 20 minutes in a day. Omega 3 – Omega 3 also promote hair growth after hair transplantation. There are many tablets available in the market as in form of food supplements. As our body unable to produce omega 3 fatty acids on its own. But we get these on some foods such as flax seeds, pumpkin seeds, trout, salmon etc. This is good for growing shaft and this will keep the scalp hydrated to stimulate hair follicle. After Hair transplant, the patient needs to avoid fast food, spicy dishes and beverages which contain high sugar. A patient also needs to be strong enough from mentally because it is an investment for their future. A small comprise in diet can help to gain best results. And it also helps the patient not to be involved in any negative reaction during the healing process. Additionally, smoking is a strict no for patients because it affects the blood supply to the head. If possible, try to avoid alcohol for a month immediately after the surgery as well. Hair nutrition is, therefore, a vital part of any hair treatment regime. A truly rigorous and systematic approach is always a secret of every thick, strong and shining hair. If any person takes balanced diet then he/she need not be required to use any anti-dandruff shampoos or any other stuff. Eating various foods will provide you with every possible nutrient you required to get a fuller hair and make a support for the success of hair transplantation. So your diet should contain protein, fruits, vegetables, grains, and an appropriate amount of fat. This will fill up every nutrient required for promoting hair cells.